The other, slightly more selfish, reason for offering to host is it meant I didn’t have to drive anywhere. This worked out pretty well, despite having to spend some time tidying the house prior to the arrival of the guests. Prior to dinner, my younger sister stepped outside to grab something from her car. Half a second later she was inside again. There was a deer out in the yard! Surprisingly, it hadn’t bolted when she’d bustled out the door, and so we all got up and went to the windows to watch it for a little while. I’m fairly certain that this is the same young buck that Raven and I startled in the back fields a week or two ago. We had been following the trail, both of us distracted, watching the path or the grass or something. As we came around a corner, there was a deer, not fifteen feet away. I just caught the briefest glimpse of him before he bolted, enough to note the thin, prong-less antlers. Raven, though likewise startled initially, gave chase before I could grab her or halt her with a command. She followed him off into the forest, where I gather the deer lost her, or she gave up the chase. She was back a moment later, apparently satisfied and ready to carry on down the trail. Clearly she was channeling her inner wolf. Grown male deer usually range in weight from about 130 to 300 lbs (60-130 kg), though larger individuals have been recorded. Given the lankiness of this youngster, and his apparent age, I would guess him to be on the lower end of that scale, maybe 150 lbs. Raven, at just 45 lbs (21 kg), is less than a third his size. However, this isn’t the imbalance it might seem at first. Historically, the only canid to prey on deer was the wolf; the rest lacked the size and strength to bring down these large mammals. More recently, northern coyotes, including those in Ontario, have begun to fill in this niche. Coyotes used to be only a western species, but started to spread east through Manitoba and Minnesota, and around the Great Lakes. Those that expanded south of the lakes retained their coyote characteristics, but those that spread through the north met and hybridized with wolves, thus acquiring some of their traits. (See this post at my mom’s blog for more about the research examining the two populations.) Larger bodies and bigger, stronger skulls and jaws, meant that they could exploit the abundant food source found in deer. These coy-wolves can be 30-45 lbs (14-21 kg), with the males growing larger than the females. I doubt Raven would’ve had any idea what to do with the deer if she’d caught up to it, however; it was probably just instinct, and perhaps some of the border collie in her, that made her chase a fleeing animal. 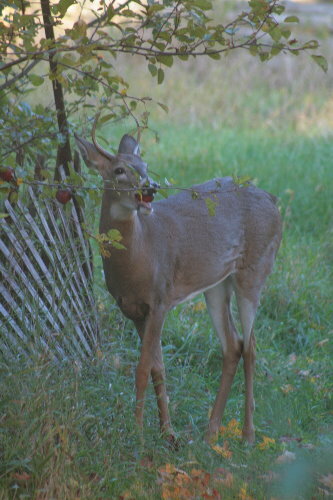 The deer grazed for a bit beside the driveway, then wandered around the cars and over to the little apple orchard the landlord planted many years ago. There’s only a few trees inside the fenced-off enclosure; they look like they haven’t been pruned in a few years, but they’re still producing nice-looking apples. Where the branches overhang the path the apples are in easy reach. He snagged one and pulled it off. 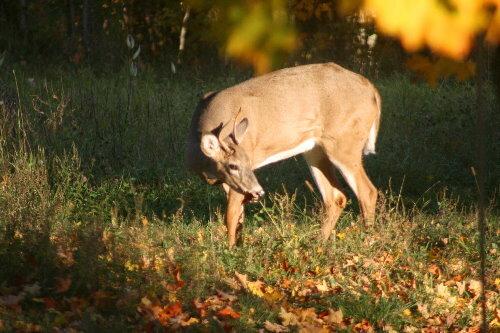 Deer are opportunistic feeders. They are ruminants, like cows and other ungulates, and have a four-chambered stomach that allows them to eat a variety of foods and forage. 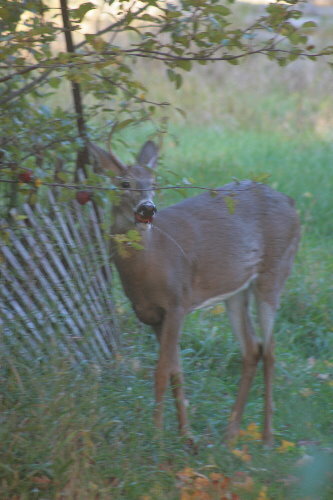 The young buck was grazing on the grass by the driveway before moving over to the apple trees. Their diet varies according to season. In the fall, particularly in bumper crop years, acorns can make up a large part of their diet. In the winter, when snow cover is thick, they will often feed on bark. They have the ability to digest some foods, such as certain mushrooms, that would make us sick. 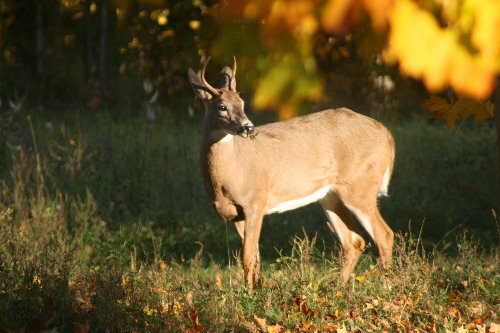 Even though we think of them as vegetarians, a deer will eat baby birds from a nest if it finds one. 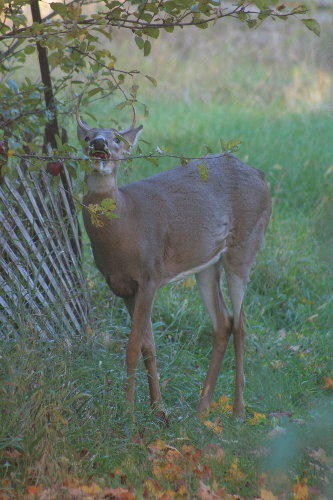 When I was working in British Columbia as a bird bander, I even had a deer eat a captured adult bird out of one of my nets, leaving just an empty hole gummy with saliva (after that discovery, the deer were not welcome in the banding area). We’d be just coming into the fall rut about now, but it’s unlikely that this youngster will be participating. Though males are sexually mature at a year old, they must compete against mature males with full racks of antlers for the privilege to mate with available females. Even when there are many females in the population, usually only a handful of males will get to father the fawns. Sexual maturation of females varies and is dependent on population levels. In healthy populations, a female will usually breed in her second or possibly third autumn. Where populations are severely depressed, females may reach sexual maturity and mate in their first autumn, though this is unusual. I had to laugh at the following statement on Wikipedia: “Though human encounters are rare there are only an average of four cases of human casualties each year in the highly populated areas such as Minnesota, North and South Dakota, and Wisconsin. 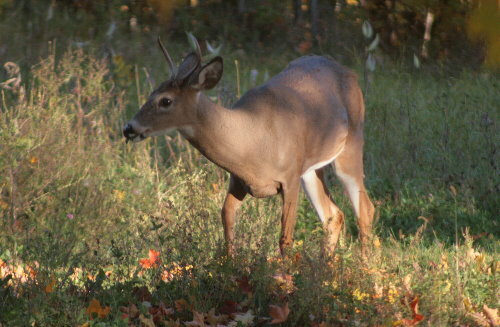 Usually, white-tailed deer will not approach a human unless it smells a bucks urine on the person.” Only four? I was astounded that there were even four! 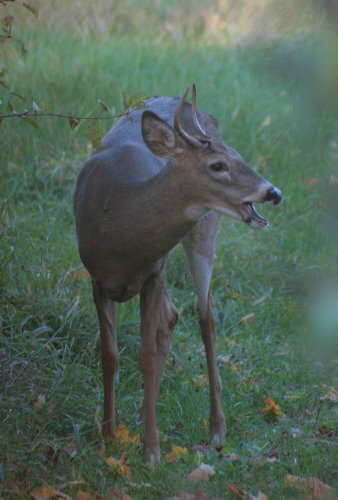 I don’t typically think of deer as aggressive animals. However, the second sentence is perhaps a clue to the circumstances – hunters carrying deer urine for the purpose of attracting bucks during rutting season might be injured in a case of mistaken identity. Hey, when your brain’s flooded with hormones, how clearly are you thinking? What a beautiful holiday visit! These are delightful shots of this young stag. I laughed about the FOUR casualties. I thought the same thing you did: Four? There are four? I wouldn’t have expected any… Then again, as you said, if a hunter is waltzing around smelling like a challenge, a buck is likely to take the bait–much to the hunter’s detriment and chagrin. Though I’ll admit I’ve seen a video of a large buck attacking a hunter; I thought it was a once-in-a-lifetime thing. Obviously not. Glad you had a good holiday with family! Thanks, Jason! He was back again a few days later, around lunchtime when the light was good, and I had to resist the urge to pull out the camera again. It would be nice to have that kind of money for a hunt of a lifetime, not all are so belssed. I’m glad to see that those who can afford it are putting back into wildlife and nature what they get out of it. The pure enjoyment of hunting, the one on one with the great outdoors, and the solitude of nature. I enjoy every minute that I can be hunting and be out with the sounds of the woods. Thank you Mr Myers and the many others who can afford this. Beautiful visitor, I love seeing the deer. Thanks, Eileen. I never get tired of seeing these guys, either.